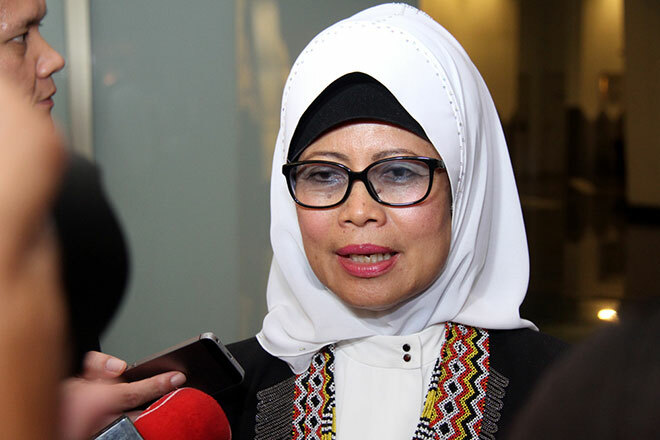 KUCHING: Minister for Welfare, Community Wellbeing, Women, Family and Childhood Development Dato Sri Fatimah Abdullah is saddened by the federal government still using population as basis for developing Sarawak despite the fact that Sarawak is oil and gas producing region in Malaysia. Fatimah, who is also Parti Pesaka Bumiputera Bersatu Women chief and Dalat assemblywoman. said she initially welcomed Prime Minister Tun Dr Mahathir Mohammad’s wish of developing and not discriminating Sarawak but the wonderful comment was marred by the fact that he uses population as basis of development. Sarawak has a population of less than 2.7 million but its geographical area is large. The richest state Selangor has around 5.7 million population while the whole of Malaysia stands at more than 32 million. Fatimah reasoned that when population size is used as the basis for approving projects, then Sarawak would continue to get a minor share of the necessary allocation for its very much needed rural roads, bridges, water supply, electricity, houses for the poor, repair of dilapidated small rural schools. She was referring to a comment by Mahathir that Dr Mahathir the federal government needs to develop infrastructure in Sabah and Sarawak but then reminded people that Sarawak has a relatively less population than the Peninsular Malaysia. “The headline that caught my attention was ‘Fair treatment for all states. PM assures there is no discrimination against Sabah and Sarawak’ as it sounds good. However the statements following the headline made my heart sink,” Fatimah said. She pointed out that the bulk of revenue from Sarawak oil and gas should be chanelled back to where it is needed most. “In this case it is Sarawak. This should be the case in order for Sarawak to attain progress as in Peninsular Malaysia. Its not only about equality but also equity,” said Fatimah.